Out now on Steam Early Access, Overkill VR is a First-Person Shooter available for the HTC Vive. Developed by Starloop Studios and published by Game Troopers, it offers a large arsenal of upgradeable weapons, plenty of levels and varied boss battles. Overkill VR’s opening area is a strange one. 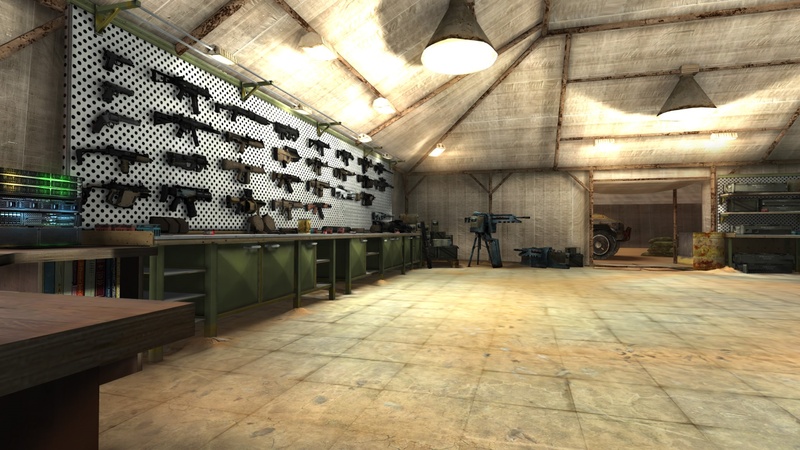 Beginning in a large armoury with a vast collection of weapons on the wall, the game immediately thwarts any notion of interacting in this inviting space. You’re prevented from moving beyond your physical play space, and none of the objects are interactive. Instead, you’re simply there to point at a large display on the wall, which functions as the main menu – pretty uninspiring for a VR game. 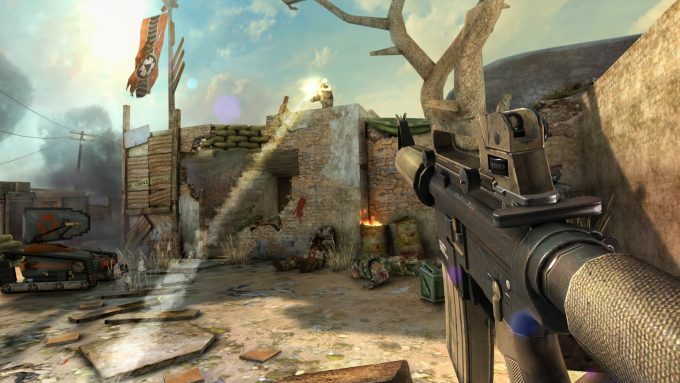 In fact, it isn’t a VR interface at all; it comes directly from the touchscreen menu of Overkill 3, a game developed for mobile platforms in early 2015 on which Overkill VR is based. The UI has barely changed, with a Vive controller acting as your pointer. It works well enough, but it’s not an encouraging start. Overkill 3 was designed as a third-person, cover-based shooter, but Overkill VR’s action takes place in first person, and thankfully, it’s a reasonably satisfying result. It’s a testament to the quality of the original level design by Craneballs Studios that a mobile game can not only survive the transition to VR, but also make the move to first person without major problems in terms of object and environment scale. While it is impressive that a mobile game can hold up at all, these are poor graphics for a PC game in 2016. The visuals are functional at best, and the environment detail is very limited. There’s no escaping the fact that the original assets had mobile rendering in mind; the poor quality of the obstacles used for cover is particularly noticeable, as they can be inches from your head. Extremely low detail geometry combined with some misaligned textures (that were never expected to be scrutinised up close) is disappointing. Enemy animation is quite stiff, and appears to be running at a lower framerate than the rest of the scene. The saving grace is that the game isn’t demanding on hardware, so if you’re hitting minimum spec for VR it should run perfectly. There are no graphics options to adjust, although the developers say they are considering adding a higher quality mode. I’d appreciate the option to remove the lens flare, which doesn’t feel right in VR. If there is a highlight to the visuals, it’s the weapons. Real-world guns are all represented with a decent amount of detail, and are upgradeable in an impressive number of ways. The original mobile game was designed as a free-to-play title, hence the focus on weapon upgrades, promoting in-app purchasing. As a paid title for VR, the in-app purchasing has thankfully been entirely removed, with upgrades accessible through credits earned during gameplay. 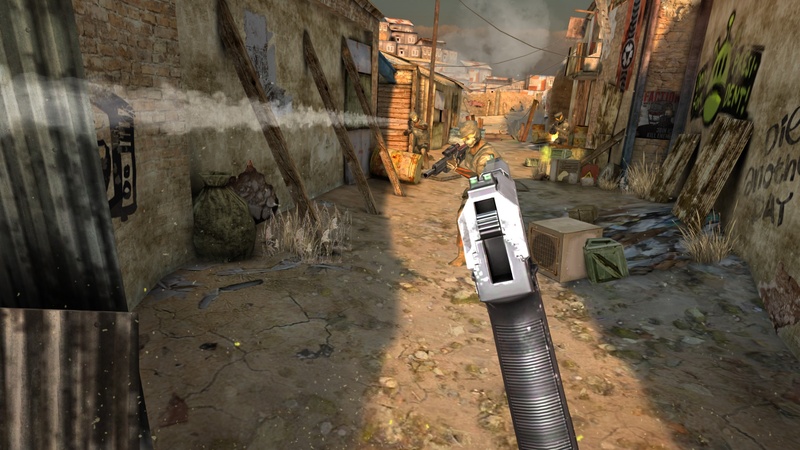 With strong similarities to the Time Crisis series, the gameplay largely involves eliminating a number of enemies from a predetermined cover position before moving on. Those with fond memories of light gun ‘rail’ shooters will likely have a good time here. You have to eliminate everyone before moving to the next predetermined spot via an instant ‘teleport’. Often there is more than one position to choose from, some offering a greater difficulty (due to less effective cover) but potentially higher scores. Random drone targets appear during the action, which you can shoot to regain ammo, health and other power-ups, and there are various enemy types with different strengths, making it important to prioritise certain targets. It’s unfortunate that the weapons don’t feel or sound quite as good as they look. The audio in general is passable, but the enemy voices quickly become repetitive and they don’t seem particularly high quality. The Duke Nukem-like voice of your character crops up when you’re performing well, and on completion of each level. Some may be amused by the ‘oh yeah’, ‘hell yeah’, and ‘that’s how we roll’ dialogue, but I found it became irritating pretty quickly, so an option to silence your character audio would be a bonus. As with most VR shooters that use tracked controllers, there is minimal (if any) aim assistance, as the main appeal here is the inherent accuracy of the controllers. It’s essential to have a steady hand, and to aim down the sights. Closing one eye to actually line up a headshot is always an impressive demonstration of VR technology in any shooter, but it can become tiring to constantly have one eye closed. Holding the gun further away, at arm’s length, it’s possible to aim fairly accurately with both eyes open, but fighting the stereoscopic split can result in eye fatigue after a while. I found myself switching between the two techniques and between my left and right eye regularly. By moving your other hand forward of the trigger, it will snap to the weapon to simulate holding it with both hands, which can give you greater accuracy, as it appears to steady the aim and reduce recoil. But holding both arms up separately, as if they’re gripping a single object doesn’t really make much sense – what you really need is a gun-like peripheral that actually locks both controllers together so they can support each other. I much preferred to physically support my dominant hand with the other (as you would with a pistol) for all the weapons, in order to steady my aim and to reduce arm fatigue. Indeed aside from this supporting role, the non-dominant controller seems rather wasted. There is no dual-welding of single-handed weapons, and there is no motion-based reload mechanic, that has proved so satisfying in games like Raw Data. One positive trait it shares with Raw Data is the importance of cover; physically crouching behind virtual walls for protection is an immediate immersion-enhancer, which makes it all the more disappointing that the reload is just done with a single press of the grip button. Unfortunately, the non-VR, mobile heritage of this game are obvious, from the low-detail geometry to the unlock-with-stars level progression. Despite this, the game can be fun, as wielding weapons correctly and physically crouching for cover is all down to player skill, and that invariably feels satisfying in VR. As the game is expected to leave Early Access in March 2017, there is some time to improve the presentation. Along with updating the game with new content, the developers have acknowledged the most-requested feature is a manual reload system, and that is now a priority. This single addition to the game would make a huge difference to the experience, so that is certainly something to look forward to. 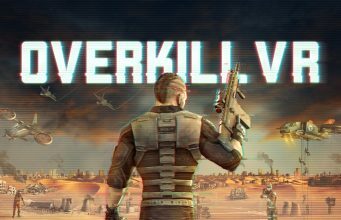 Overkill VR is available now via Steam’s Early Access program here with a full release planned for March 2017. 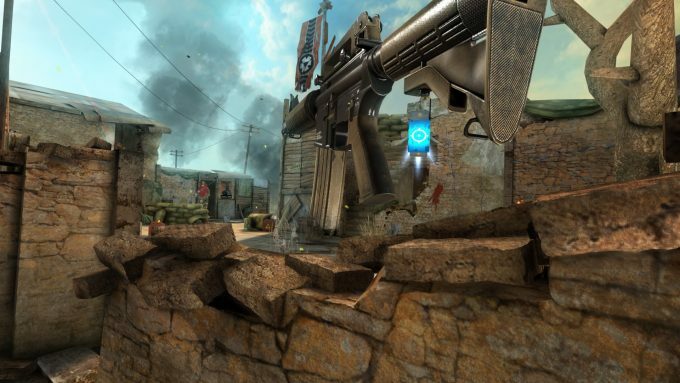 The post First Look: Overkill VR is a VR FPS Hamstrung by its Mobile Heritage appeared first on Road to VR.